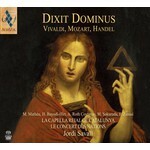 Three composers and three masterpieces based on a cornerstone of the Bible, the psalm Dixit Dominus makes up Jordi Savall's latest recording. Following the critically acclaimed Magnifcat & Concerti two years ago, here we experience the full maturity of Savall's ensembles. The vivid orchestral colours, the ideal spacing of the instruments, the infallible virtuosity of the choir, the bright sound bringing out both the delicate and the bold within the works prove that Jordi Savall has established a new standard for the recording of 18th Century music.